The Veldo slatted cover supports 70kg/m², providing a certain degree of safety in the event of an accidental fall by a child. This safety can be reinforced by the fitting of handrails. 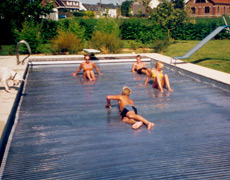 Solar type slats allow the pool to be heated in good weather whilst keeping it closed and thus secure. The pool temperature is maintained by the cover insulating power. The installation of a cover reduces evaporation by about 90%. This is particularly useful for indoor pools. Reduction of the quantity of products due to covering of the pool and the reduction of their dispersion into the atmosphere (Environmental protection). Eased because the pool is covered.